VegaMega is an innovative omega-3 supplement that is produced without the use of any fish. Being derived from microscopic algae instead, VegaMega contains the healthiest versions of the omega-3 fatty acids DHA and EPA. The product is 100% herbal and manufactured using Licaps® liquid-filled hard capsules (LFHC), an encapsulation technology formulated to impart to supplements improved bio-availability, shelf-life (near-zero oxidation), time-release reliability, taste, and odor. Moreover, the use of micro-algae means there are no heavy metals in the omega-3. Nature’s Pro extracts the DHA and EPA using a completely natural process without any refining or heating. 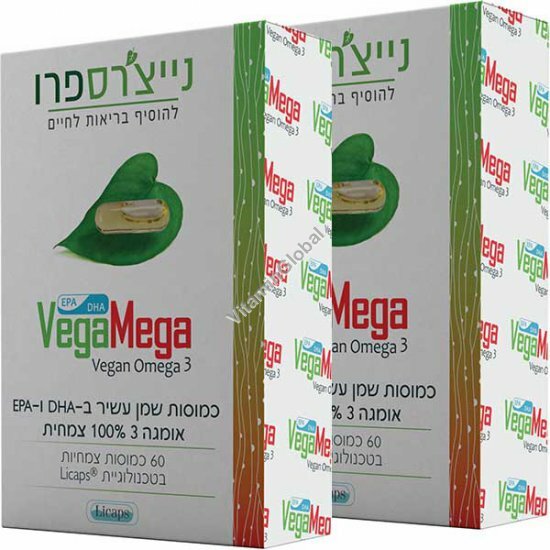 Most importantly, VegaMega’s omega-3 fatty acids are in triglyceride form – a natural structure that is more easily absorbed by the body than the usual omega-3 derived from fish and other marine creatures, and which is also non-allergenic. Ingredients: Each 595-mg capsule contains 500 mg of marine algae-sourced omega oil (150 DHA; 75 EPA), plus: oleic acid from sunflower oil, rosemary extract, tocopherol, and ascorbital palmitate. Instructions for use: 1 capsule once a day, with food. Kosher Lemehadrin: Badatz Chug Chatam Sofer, Petah Tikva & Rabbi Gad Attias, Mateh Yehuda Rabbinate. Pregnant women, lactating women, people on medication, and parents considering this product for their children - consult your physician. The information above is not medical advice. In case of a medical problem, consult your physician.